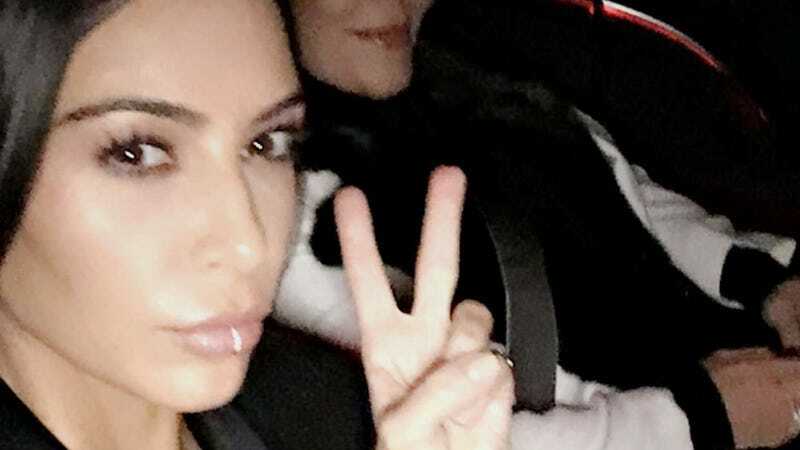 Kim Kardashian West—or maybe just Kim Kardashian, or maybe Kim Kardashian [peach emoji], or maybe just Kim—posted her first selfie of the year Wednesday night on Snapchat. But the image was a bigger deal than her caption (“first selfie of 2017 w my mama”) suggested. This was Kim’s first published selfie since being robbed in Paris last October. She’s been in selfies, but not as the photographer. This is Kim in komplete kontrol. You may be scoffing at this news, and perhaps even rolling your eyes that I called a low-quality photo of Kim and Kris “news” at all, but please remember that this is a woman who has taken so many selfies over the past decade that she assembled them into a very thick coffee table book (that my feet are currently resting above). Three-months of selfies for Kim is a lifetime of them for plenty of people. I almost hate to say it (no I don’t) but the internet has felt a little different in her absence. Emptier. I think I may have needed Kim to be using her front-facing camera in order to feel whole in this place, so it’s a minor relief to see her using it again. The story might be worth considering and not dismissing immediately. We’re not hearing about it from the Daily Mail, or a British paper. It’s not coming from the Enquirer or Star Magazine. These are, supposedly, “family sources” talking to a Lebanese publication. Also, the Clooneys have been undercover for a couple of months now. Like, really, really quiet. Read the rest of her analysis here. I...think I may almost sort-of perhaps could maybe believe it. Rita Ora captioned this photo, “I can’t wait for this again,” but I don’t know what “this” is.